If you have an abundance of spare firewood but no place to stash it properly, look no further than these easy and affordable log racks that you can make in a weekend. There’s nothing more comforting on a cold winter’s night than curling up in front of a crackling fire. But it takes fuel to keep those home fires burning, so you need to make sure you have logs on hand. The trouble is, when you have more wood than you can burn—and nowhere to store it—the excess is often scrapped or improperly left on the wet ground, where it can rot from exposure to heat, water, and pests. 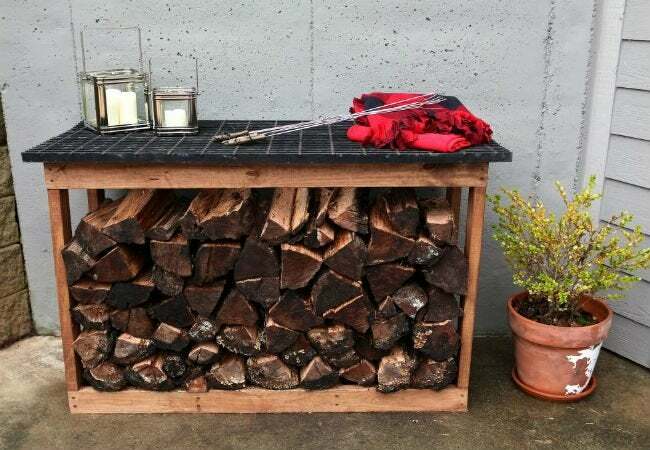 Fortunately, there are a number of DIY storage solutions that can shelter your firewood from the elements. We’ve handpicked five that will keep your stash safe and sound—sleeping like logs, you might say. This midcentury-inspired firewood holder from The Nest brings modern sophistication to old-world fireside traditions. Cleverly constructed from two tomato cages that have been clipped to size and welded together with epoxy, this holder gets a chic touch with a few coats of high-gloss black spray paint. After all the elements have dried, connect the circles together with a strip of leather cord, and finish by placing the log rack atop wooden blocks for greater style and stability. 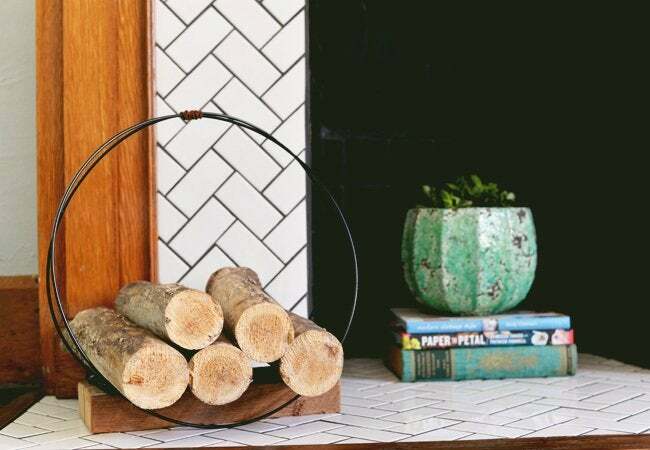 Invigorate your hearth and home with an industrial-vibe log holder that’s modern and utilitarian, and won’t tempt pesky termites. 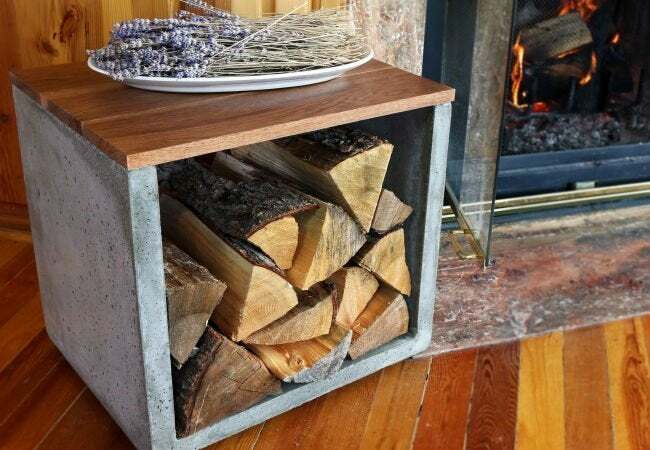 To re-create this sleek, minimalist design from DIY Pete, first construct a concrete form by cutting a melamine sheet into pieces to be assembled into an inner and outer box. Connect the two boxes together to make the form, and then fill it with Quikrete mix. Once the concrete has cured, remove the form and sand down the concrete, and affix both a wooden top and four feet for a rustic finishing touch. 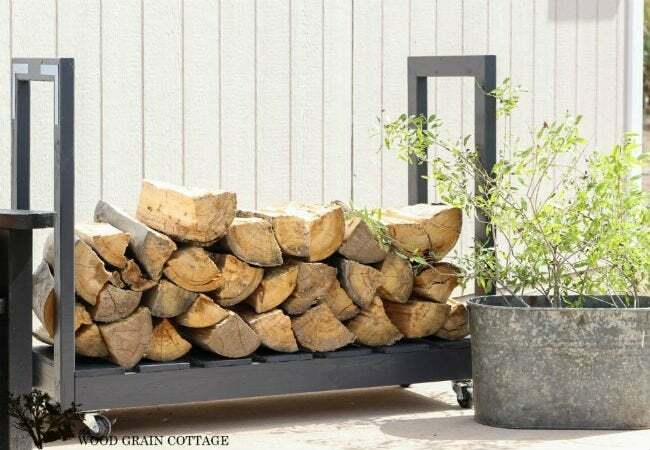 This crafty rolling firewood rack not only makes the process of loading and retrieving wood super simple, it also lends some style to your hearth or backyard. To build something similar to this piece that was created by the blogger at The Wood Grain Cottage, cut redwood into planks, then secure them together with a nail gun to form the frame. Next, cut the sides of the cart from smaller wooden planks and connect them to the base. Attach slats from old pieces of wood or fence pickets, add casters, and finish with a few coats of paint to give your firewood a fun and functional home. If frequent backyard gatherings have you at a loss for not only where to stash extra wood, but also where to keep your spare grill grate, then this solution from Bower Power Blog has everything you need. To form the frame, saw 2×4 boards of pressure-treated lumber into planks for the top, base, and upright supports. Then, assemble the rack and stain as desired. Lay the grill grate over the top, giving you a place to store this unwieldy extra as well as a one-of-a-kind landing spot for outdoor odds and ends. 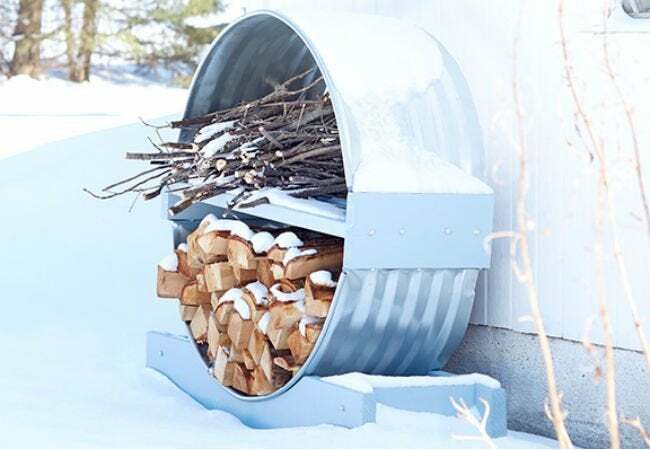 Let your logs hibernate all winter long in this sheltering firewood nook from Lowe’s, fashioned from metal window wells and pressure-treated wooden boards. Start by constructing and assembling the shelf and base from cut wood. Then, attach the flanges of each window well to the sides of the shelf. Finally, drive in screws with washers to fasten the shelf to the base. With bricks or pavers placed underneath, this roomy storage unit will stand at the ready whenever you need to add fuel to the fire!